There are many preparedness sewing projects you easily can do based on your particular needs and novice-level sewing skills. The most important thing about preparedness sewing projects is the proper equipment. Knowing how to use a needle and thread is where you’ll need to start, but eventually you’ll want to start using a sewing machine. Some projects will require a sewing machine for particular stitching, and you’ll be happier because you can work more quickly and effectively. Garage sales are a great option to find used sewing machines. Family members also might a machine you can use for your preparedness sewing projects. If you don’t have one, first ask around before making an investment. 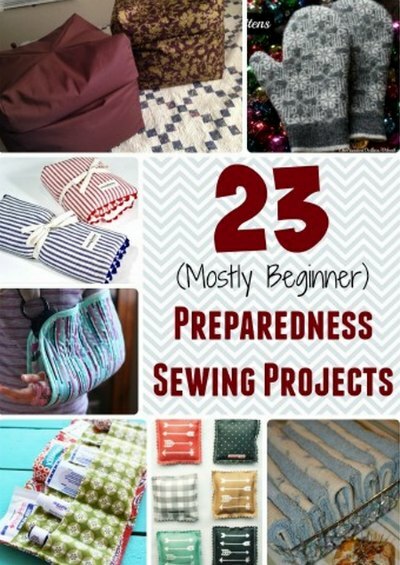 There are many preparedness sewing projects that can be done at home. This includes various items for medial use, emergencies, projects for the home, things to keep you warm in the winter, and more. Most projects will require the use of a cloth or fabric. You can find various types of fabrics online or at any local fabric supply store. You need to make sure a few things are in place before starting this project. The main thing you should consider is where to work on your preparedness sewing projects. One option is a spare room or even your basement. If you have a spare room that is not being used, then convert it into a sewing room. This is a great idea if you need a place that is quiet and private, or won’t be disturbed by kids or pets. Completing various preparedness sewing projects will be rewarding. You will know that you can make an item that is required or necessary around the home and how to use a new skill.